Peacock blue and fuchsia seed beads wend glimmering trails through canyons of polished black onyx in this exceptional handcrafted necklace and earrings set. The black onyx stations are slightly torqued squares with centre openings. 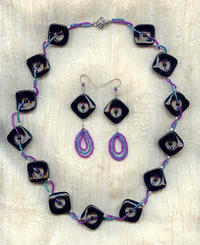 The silver-lined seed beads wander through them with the aid of tiny white fresh water pearls and 4mm black onyx beads. The 25 inch strand closes with a sterling silver 'S'-hook wired with a faceted black onyx bead. 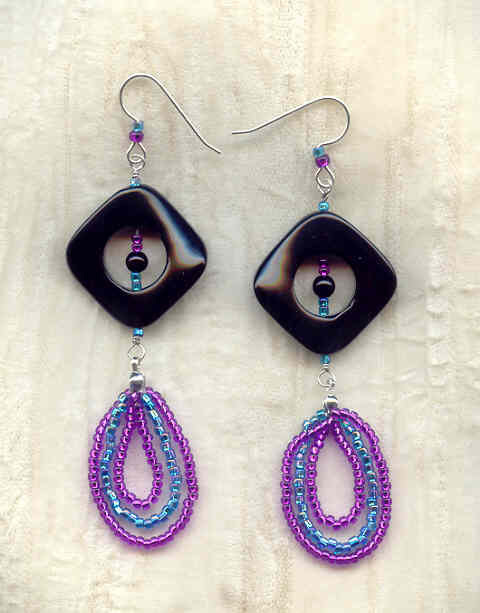 The earrings feature the same black onyx beads and stations, and loops of matching seed beads. They dangle about 3-1/2 inches from the tops of their sterling silver French hooks. Playful yet elegant, it's another innovative design from SPARKLE PLENTY.